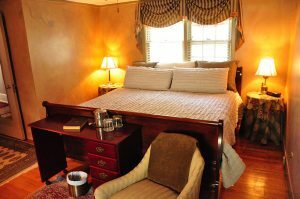 A Dramatic flair best describes the spacious guest rooms, named in honor of famous playwrights who bartered their plays for Virginia Ham at Abingdon, VA’s world-famous Barter Theatre. They exude relaxed beauty. 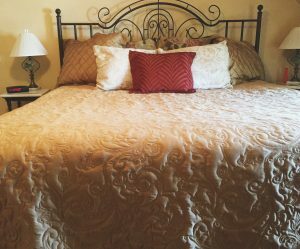 You will feel your cares melt away as you rest in the comfort of our luxury travel accommodations perfect for a romantic weekend or private vacation getaway. Each has a private, in-room bath and working fireplace-seasonal. Four of the rooms have over-sized whirlpool tubs and separate, tiled walk-in showers. All our rooms have Cable TV/entertainment units — exactly what one expects from a bed and breakfast. Decorated in mellow jewel tones, this mini-suite offers a king-size Charleston-style iron bed and a separate sitting room with a 150 year-old burled walnut chest of drawers with marble inlay. A local artist has subtly hand-painted the walls with beautiful tone-on-tone birch tree patterns, adding a unique touch to the suite. 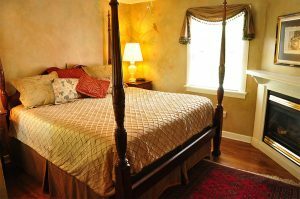 The floors are decorated with Oriental rugs in both the guest room and bath. So put your feet up and enjoy the fireplace-seasonal or curl up and read in one of the window seats overlooking the birch trees. This suite is decorated with cabbage rose designer fabrics, persian rugs, and antiques. 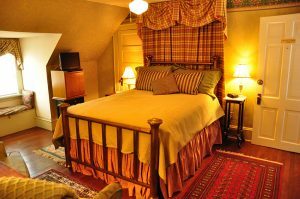 Named in honor of Robert Porterfield, founder of the historic Barter Theatre, this room with its 200-year-old American walnut chest of drawers and king-size four-poster rice bed placed in front of the fireplace-seasonal. A dormer window seat overlooks the grounds and offers a cozy nook for reading or quiet time. P. Buckley Moss and other fine works of art adorn the walls, which have been hand-painted and scumbled with an aged warm patina to reflect old-world elegance. Decorated in deep jewel tones, floral accents, and a century-old armoire, this room offers a king-size mahogany sleigh bed overlooking the garden, and a window seat overlooking a large old dogwood tree. A Chippendale sofa is done in off-white velvet and an antique butler tray table sit across from a romantic fireplace. Oriental rugs decorate the floors in the guest room and bath. The walls have been hand-painted with a scumbling technique to reflect the warm hues of the decorator fabrics and have been embellished with hand-stenciling. This is our only first-floor guest room. 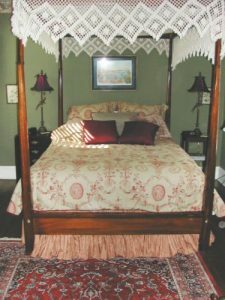 The decorative queen-size four-poster canopy bed is the focal point of the room. It features a hand-crocheted canopy and bed skirt. Oriental rugs decorate the floors in both the guest room and bath. You can relax in front of the fireplace-seasonal and enjoy the soothing sounds of the garden waterfall. Decorated in lighter shades of jewel tones, this cozy room offers a queen-size century-old brass bed and a fireplace-seasonal. The window seat is a wonderful spot for bird watching. The guest room floor is decorated with Oriental rugs, and a needle-point rug adorns the floor in the bathroom.